Troop training has never been more easy or affordable with virtual reality programs designed especially for the military. 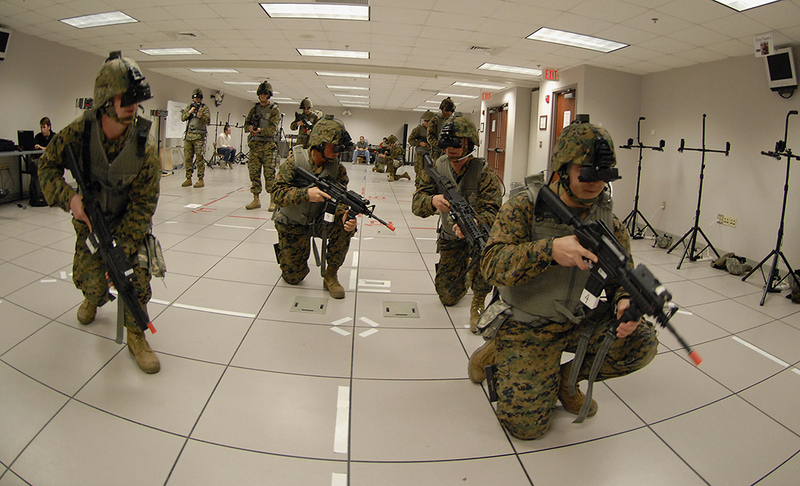 The armed forces are incorporating VR into troop training in a wide variety of ways, making training more interactive and engaging than ever. As a result, troops acquire skills more quickly and retain the knowledge they learn through personal connection. We create VR training softwares to help companies boost the performance of their team. Training simulations offer a virtual boot camp that is not only more convenient for recruits, but also very effective. Specialized programs help train troops in specific ways, targeting what each branch requires. Whether the Navy, Army, Air Force or any other military operation, there is a different program targeting the different requirements in terms of skill drills, physical fitness and other areas that require development during boot camp. Virtual boot camp also helps reduce the need for as many hands-on instructors, allowing more personnel to be in the field or elsewhere instead of constantly training new recruits. Both vehicle and flight training can be costly, sometimes resulting in damage and always resulting in loss of fuel and time. Simulations save on costs and provide the kind of experience that is not always available during basic training. Soldiers can learn how to operate a plan or vehicle as well as how to handle emergency situations, prepare for worst case scenarios and even how to communicate while operating vehicles. The simulators even mimic the movement of a real vehicle or flight to help prepare the troops’ bodies for actual driving and flying in the field. A feature that is not available through life training, instant and constant feedback is also provided to help the soldier adjust accordingly. Preparing mentally for medic needs in the field is very different from experiencing the sights, sounds and even smells while caring for injured warriors in battle. Medic training can help new medics prepare much more realistically than typical training can, providing them with the simulation of a real battle to understand what is at stake during the job. Virtual reality medic training can help medics focus on what is most important during a battle, eliminating much of the confusion and hesitation that can be present during a soldier’s first battle. It can also help them prepare for scenarios that have not yet occurred, a part of training where the usual methods come up short. Simulating the actual battlefield for soldiers who will be facing combat is possibly the strongest area in which virtual reality can prepare troops during training. In the past, popular movies and books were the closest examples a new soldier had of a war zone. Today, they can become fully immersed in a virtual program that helps them train their senses to be fully aware of what is happening without the risk of actual harm, helping them know what to expect when they are ready for battle. The three-dimensional environment allows the soldier to move around and interact with the environment for the closest experience to the real thing.